Sign up and receive Property Email Alerts of Houses for sale in Overkloof, Hout Bay. 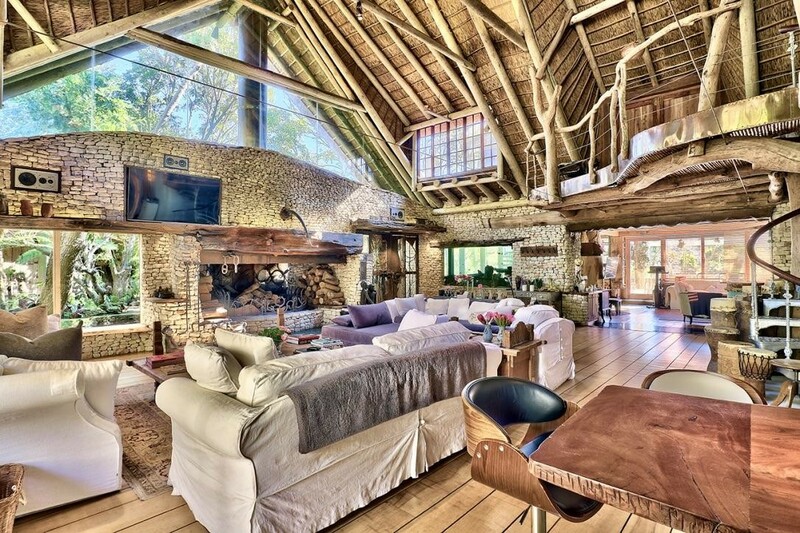 Possibly the most interesting and imaginatively designed house for sale in Cape Town; certainly one of the national treasure homes of South Africa. Recently featured on Top Billing. Built over 25 years of constant creative evolution, this stunning and sprawling family house displays a breathtaking level of flair combined with a collector's attention to detail which has to be seen to be believed. The culmination of a generous budget and the input of one of South Africa's most brilliant creative and commercial minds, the house manages to combine intimacy with grandeur; quirkiness with practicality; urban mod cons with a sense of rural harmony. It is potentially the ultimate house, delivering a home owner's dream on many levels: comfort, security, unlimited recreational possibilities, space, as well as cosy charm. Equally suited to raising a family and adult entertaining on a grand scale, this is a home which will inspire love and devotion like no other. Situated in the favoured and exclusive Constantia Nek area of Hout Bay and set in grounds of around three quarter of an acre, the built area of the property extends to nearly 1600 sqm. Luxuriating in remarkable mountain views over Orangekloof, the Vlakkenberg and the back of Table Mountain, this north facing home enjoys the best of Cape sunshine, complete with memorable sunsets. The house has been 'interwoven' into its natural hillside landscape, prompting comparisons with a palatial rainforest lodge. But it is much, much more than that. With 5 generous bedroom suites as well as staff accommodation, numerous decks and terraces, a multitude of entertaining and recreational rooms, together with outdoor space and features to satisfy even the most jaded of luxury home buyers, this property really has it all. Two garages, one large enough to accommodate a basketball court, will house most car collectors' inventory. Or if wine is your thing, the cellar is a subterranean masterpiece: cavernous, with a large feature table and bins set into the walls, surrounded by fish tanks which not only give the impression of being inside a marine wildlife documentary, but also serve to keep the temperature at the right level for your vinous treasures. The large pool has its own water slide, together with ropes, swings & a zipwire, for those who like a bit of jungle-gym thrown in with their aquatic pleasures. There are outdoor showers adjoining bedroom suites and a 9 seater jacuzzi on one of the entertainment decks. If that isn't enough water to satisfy you, there is a steam room in the gym (complementing the dry heat of its sauna). Continuing the water theme, the front of the house is surrounded by a network of Koi ponds which give the impression of being part of a miniature canal system. This theme then continues inside, with an integrated fish tank, part of which affords views through its water to the lush, tropical greenery outside. The underwater fish tank viewing windows which form part of the wine cellar are also repeated in several other rooms of the house. It all makes for an enticing and magical blend of the elements, experienced in a vibrant domestic hub in a way that few other houses we have seen before manage to achieve. The interior is full of show-stopping artefacts and design pieces, many of which were painstakingly hand-built by leading South African craftsmen, to an international standard. From the 16-seater main dining table to the enormous shell hand basins, to the cavernous hand-built fireplace and the industrial steel doors to the gym, via stained glass windows and intricate mosaic tiled bathrooms, the museum quality of some of the rooms and their furnishings really needs to be seen in the flesh. As you enter the house via Conrad Hicks designed front doors, the property just begs to be explored. You will find pleasant surprises around every corner, rooms and outdoor space to indulge every sense and accommodate every pastime. Needless to say, this house has to be viewed. A comprehensive brochure is available on request. Gym with full bathroom, steam room and sauna with underwater pond window./ Size of outbuildings: 390 sqm. Sign-up and receive Property Email Alerts of Houses for sale in Overkloof, Hout Bay.